Two cities that are most definitely worth visits while in Portugal. I fell in love with Lisbon two years ago and was very excited to return for a second visit while it was my very first time discovering Porto. We ended up driving from Lisbon to Porto which took about 3h (not including the stops we made along the way). Both cities are perfect weekend destinations or for a short little getaway! Personally I would recommend to visit both Lisbon and Porto either during spring or fall. Before it gets too hot and before the temperatures gets a bit too chilly. There’s nothing better than to welcome spring a bit early or to elongate the summer a tiny bit! March was a perfect time to visit in my opinion and I would gladly go back during this time. Strolling a boiling hot city, that’s located up and down steep hills, is maybe not the most pleasurable way to see these places as the closest beaches to both towns are about 30-40 minutes away – even though both cities are located just next to the water. Wear whatever you prefer as long as you pack a pair of comfortable and good shoes to walk in. For me, the best way to see Lisbon and Porto is by foot and since that requires a lot of walking, mostly on slippery cobblestone streets and up and down steep hills, I would highly recommend packing appropriate shoes for this. Getting to the cities from either airport is quite easy and quick by taxi – especially Lisbon as the airport is barely outside the city. Once in the city, as I mentioned before, exploring the cities by foot is the best way to go. But if you want to pay a visit to Belem, about a 1 hour walk outside of Lisbon for example (and a beautiful one at that since it’s along the water almost the entire way), you can always jump on one of those rentable little scooters and reach your destination is just a couple of minutes. So much fun and feels a bit safer as most of the road there and back is either made for biking or walking (and stays flat). I can imagine that Lisbon might be one of those places you either love or hate… Why? Well, first of all, the historic centre can look quite badly maintained with many buildings needing major work done and graffiti covering a lot of facades. Which some people might not find especially pretty. It’s also extremely hilly, which means that walking can be quite tough if you’re suffering from any problems with this or if you visit when it’s extremely hot. Despite this, I’ve fallen in love with this place two times now. I see the old and sometimes damaged buildings as charming and something that adds character to the city. The tiles are just to die for, the colours so bright and beautiful. The hills can be tiring but I choose to see it as a free workout since I’m not a member of any gym, haha. …And have learned to visit when it’s not boiling hot – which definitely helps. Most people that I met are also so welcoming and very friendly (and almost every single person speaks great English!). 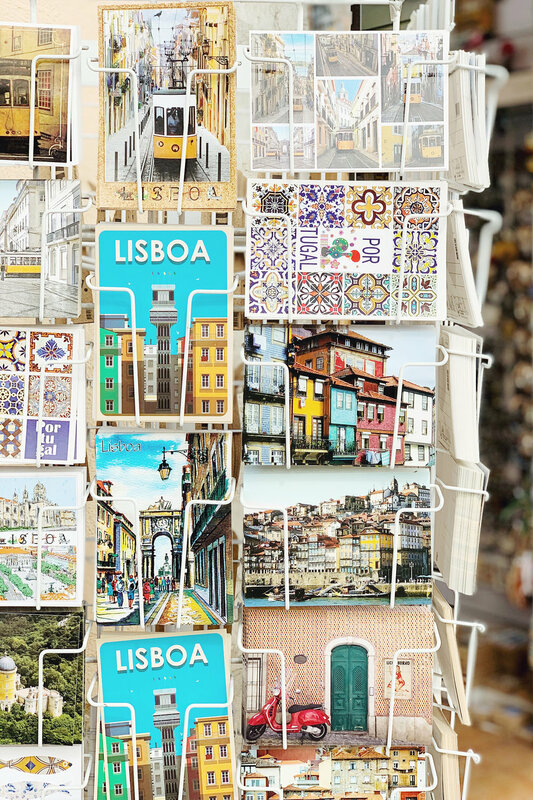 If you tell anyone that you’re going to Lisbon, it’s quite likely that you’ll have at least one person give you the recommendation of going to the “Time Out Market” while in town. And with good reason! This huge space has been transformed into an enormous dining room with restaurants, wine bars and pastry shops lining the walls inside. You can literally eat Portuguese food, Asian food and Italian all at the same time if you’d like. It’s a huge food hall where you share tables with other visitors and locals. The quality of the food is actually very good and I love the atmosphere in this place. Av. 24 de Julho 49, Lisbon. Chef Avillez has a bunch of restaurants in Lisbon, or at least that’s what it feels like. I’ve yet to try them all but so far I definitely prefer this one. I love the second dining room, which looks like a little kitchen in someone’s home where you can watch the chefs prepare simpler dishes while enjoying your meal. I’ve always enjoyed great service here and especially love a mushroom risotto that seems to be a guest’s favourite on the menu. R. Duques de Bragança 7, Lisbon. Another restaurant of Chef Avillez’s that might be worth a visit is the Taberna, inside Bairro do Avillez. It’s a restaurant where you can share smaller tapas plates of food. I would definitely recommend stopping in this little area of the restaurant instead of continuing on to the back area of the place, also known as the Pateo restaurant, which I found to be extremely overpriced for the food you’re served (despite being very pretty to look at). R. Nova da Trindade 18, Lisbon. This chain serves up Portuguese sandwiches and other simple dishes. It’s nothing crazy special but more than does the trick if you’re keen to try one of those delicious steak sandwiches one day. Avenida Praia da Vitória 77 B, Lisbon. This little cute café is the perfect place for a brunch in the sun. Their outdoor terrace is absolutely adorable and they serve everything from coffee and salads to hotdogs (yeah, I know it sounds a bit odd) and waffles. R. Moeda 1A, Lisbon. It seems as though the minimalist coffee shops have reached Lisbon as well. And Hello, Kristof is one of them. It’s a beautiful space and you’ll find coffee and simpler dishes along with cake on the menu. Definitely not the most traditional option in town but worth a visit if you’re craving a good cup of coffee. Rua do Poco dos Negros 103, Lisbon. Just copy and paste what I just wrote above and maybe add in a few more food options here and you’ll pretty much get the idea. Located by a cute little square and right across a juice bar, you might think that you ended up in Sydney somewhere for a quick second. Rua do Poco dos Negros 1, Lisbon. Exactly what it sounds like. A coffee shop in a very Scandinavian interior in a cute little neighbourhood. R. Nova da Piedade 10, Lisbon. Located on the top of a parking garage, this bar can be a bit tricky to find but once you reach this rooftop overlooking Lisbon you might understand why it’s so popular. In a green little oasis, crowded on any sunny day, you can enjoy a cocktail or beer before heading onto dinner. Calçada do Combro, 60, Lisbon. This little place has the most adorable view of the iconic Lisbon tram going up and down the hill. If you’re lucky and it’s sunny outside, grab a comfy chair outside and order a juice, glass of wine or coca cola and enjoy the view and the sun! Bica nº1, Rua dos Cordoeiros, Lisbon. 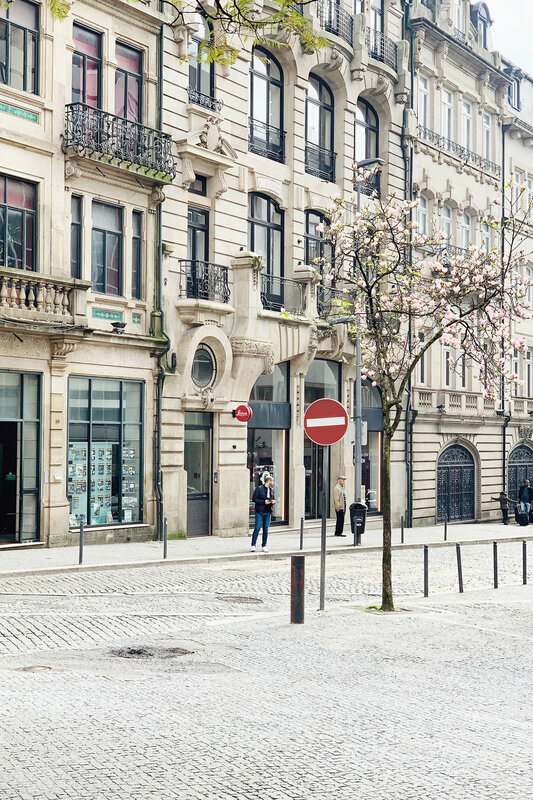 After visiting Lisbon, Porto can definitely seems a bit less colourful on the outside, but don’t let that fool you! It’s such a lovely city that is home to so many exciting new restaurants, cafés and sights. It seems as though the city has become extremely popular during the last couple of years and might be describes as Lisbon’s younger, slightly trendier sibling. But what do I know! I’ve only visited once but would love to come back again in the future. If for nothing else, I would come back for the food alone! Just as for Lisbon though, bring comfortable shoes since you’ll be doing a lot of walking. Up and down. One of our favourite food experiences while in Porto was at Cantina 32. Entering the restaurant feels like entering one of those cool and trendy new places in Milan or New York for example – but not in a pretentious way at all. Their food is seriously good and feels homey and again, not pretentious. They serve an upgrader version of McDonalds’ fries with cheese on top, ridiculously good pork ribs and a whole octopus to share. R. das Flores 32, Porto. Just next to a cute little square, a stone’s throw away from the water, you can find this adorable restaurant. The outdoor terrace is cute and if it’s sunny, it might be the perfect place to stop for a bite with a cooling breeze. They serve traditional Portuguese dishes with no fuzz and that’s pretty much it. I went for the chicken in red wine which I very much enjoyed. R. de São Nicolau 1, Porto. A few steps away from the restaurant above, located on the little square, you’ll find this restaurant specialised in fish. The terrace is irresistible during sunny days! Largo do Terreiro 11/12, Porto. One of my favourite food experience in a while happened at Almeja. This beautiful gem, decorated with modern details against the original stone walls is a can’t miss while in Porto. They have a delicious tasting menu for a reasonable price that I definitely recommend! The service was impeccable and I’m already dreaming about returning in the future one day. Rua de Fernandes Tomás 819, Porto. The specialty coffee and the trendy coffee shops have reached Porto as well! And Combi Coffee is the one I managed to try while there. I’m sure there are many more, but a girl can only have so many coffees each day, haha! Rua Morgado Mateus nº29, Porto. During our stay in Porto, we stayed at the Porto AS 1829 Hotel. It’s the perfect location in the city, beautifully decorated and very friendly staff who was more than helpful with recommendations for eating and sightseeing while in town. 45-55, Largo São Domingos, Porto.